Dr McMahon said that since central banks are aware that what they say impacts the markets, they agonise over the language of each statement they produce. View the interview; "The art of central bank talk"
The interview has a further interest for the Department, as the segment itself was produced by a Department of Economics alumnus. Tom Davies graduated from The University of Warwick in 2012 and is currently working as a freelance TV producer at both the BBC and CNBC. It was great to hear Dr McMahon's insights on central bank communications and especially his view that Carney was seen as "too candid" in his initial Bank of England interviews. 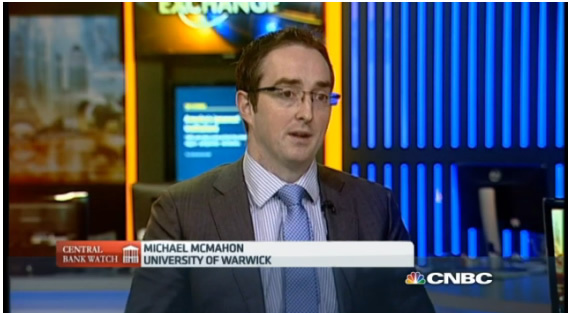 This has been a hugely important topic for markets since forward guidance became standard practice and Dr McMahon is one of the few academics to look into the more practical aspects of monetary policy. We've spoken a few times since I left Warwick and it was great to finally put him in front of a camera."